In the National Book Award-winning "Let the Great World Spin, "Colum McCann thrilled readers with a marvelous high-wire act of fiction that "The New York Times Book Review "called"""an emotional tour de force." Now McCann demonstrates once again why he is one of the most acclaimed and essential authors of his generation with a soaring novel that spans continents, leaps centuries, and unites a cast of deftly rendered characters, both real and imagined. Newfoundland, 1919. Two aviators--Jack Alcock and Arthur Brown--set course for Ireland as they attempt the first nonstop flight across the Atlantic Ocean, placing their trust in a modified bomber to heal the wounds of the Great War. Dublin, 1845 and '46. On an international lecture tour in support of his subversive autobiography, Frederick Douglass finds the Irish people sympathetic to the abolitionist cause--despite the fact that, as famine ravages the countryside, the poor suffer from hardships that are astonishing even to an American slave. New York, 1998. Leaving behind a young wife and newborn child, Senator George Mitchell departs for Belfast, where it has fallen to him, the son of an Irish-American father and a Lebanese mother, to shepherd Northern Ireland's notoriously bitter and volatile peace talks to an uncertain conclusion. 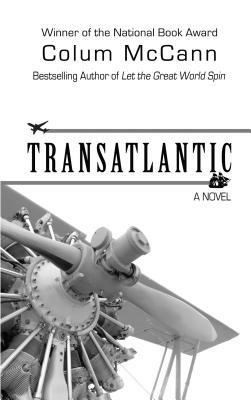 The most mature work yet from an incomparable storyteller, "TransAtlantic" is a profound meditation on identity and history in a wide world that grows somehow smaller and more wondrous with each passing year. "One of the most electric, profound novels I have read in years." --Jonathan Mahler, "The New York Times Book Review"
"Stunning . . . an] elegiac glimpse of hope." --"USA Today"
"Marvelously rich . . . a Joycean look at the lives of New Yorkers changed by a single act on a single day." --"The Seattle Times"
"McCann's gift is] finding grace in grief and magic in the mundane, and immersing the reader in these thoroughly." --"San Francisco Chronicle"
"An act of pure bravado." --"O: The Oprah Magazine. Colum McCann is the internationally bestselling author of the novels "Let the Great World Spin, Zoli, Dancer, This Side of Brightness, "and" Songdogs, " as well as two critically acclaimed story collections. His fiction has been published in thirty-five languages. He has received many honors, including the National Book Award, the International IMPAC Dublin Literary Award, a Chevalier des Arts et Lettres from the French government, and the Ireland Fund of Monaco Literary Award in Memory of Princess Grace. He has been named one of "Esquire"'s "Best & Brightest," and his short film "Everything in This Country Must" was nominated for an Oscar in 2005. A contributor to "The New Yorker, The New York Times Magazine, The Atlantic Monthly, "and" The Paris Review, " he teaches in the Hunter College MFA Creative Writing Program. He lives in New York City with his wife and their three children.